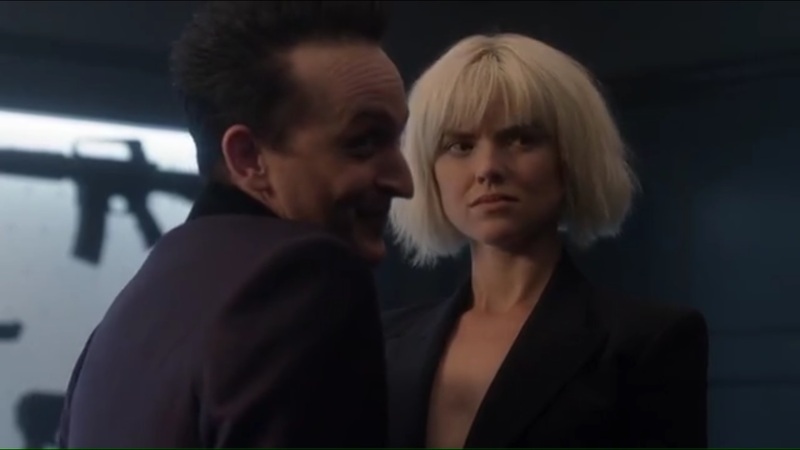 A Look at Gotham- Season 4, Episode 2: “A Dark Knight: The Fear Reaper” | What Else is on Now? 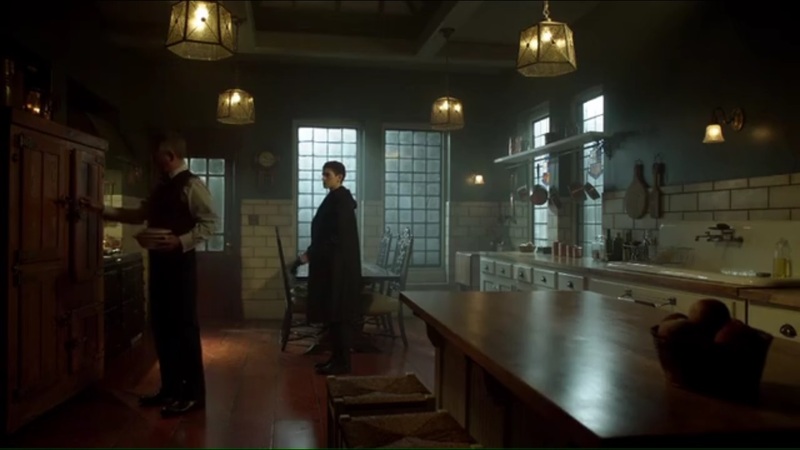 The episode begins with GCPD converging on Crane’s home, based on word from Merton. 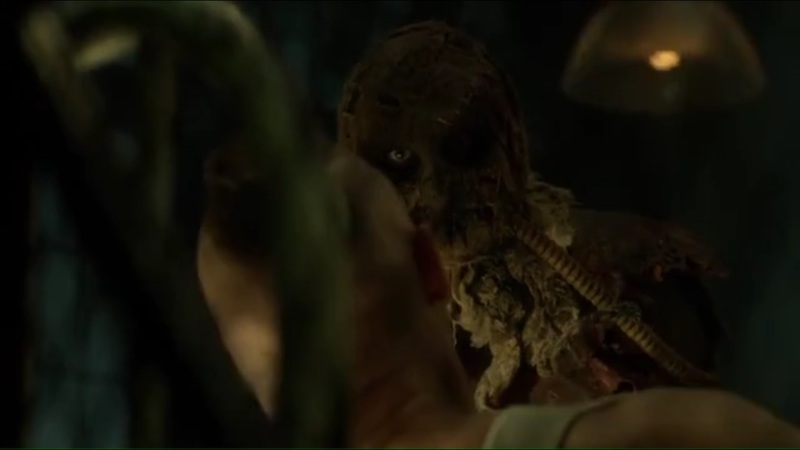 After finding evidence that Crane has been working on the toxin, Jim and Harvey head outside and find Grady outfitted in a scarecrow’s outfit. He yells to the two officers that the Scarecrow is coming. Sounds ominous. At the police department, Alfred comes to pick up Bruce, and expresses his doubts that Bruce would’ve been able to handle these robbers on his own. 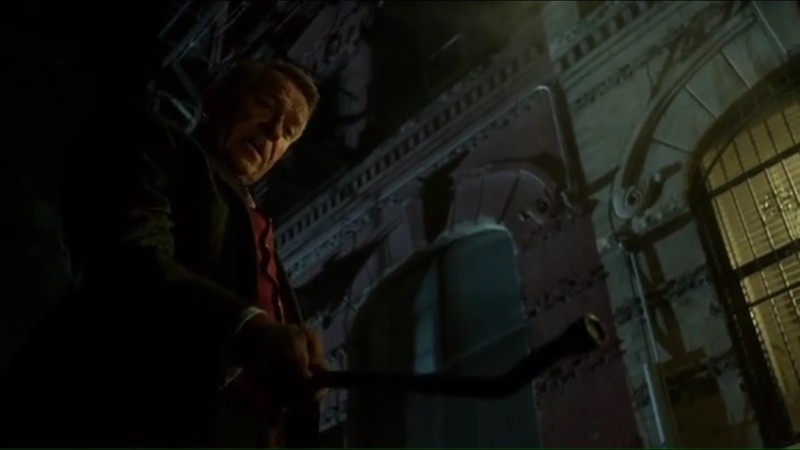 Bruce tells Jim that he dropped in on a robbery in-progress, and he was on the roof because he was looking for Selina. Seems plausible. Jim springs Bruce loose and wants to discuss this later, but not tonight. 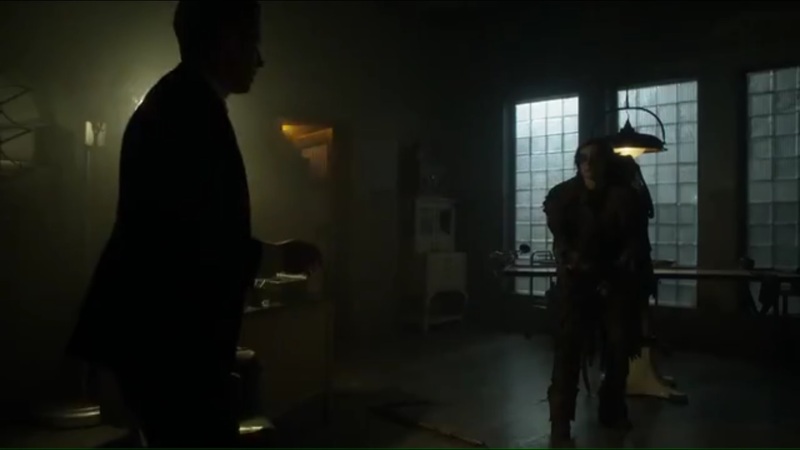 Crane, still in the Scarecrow garb and now armed with a scythe, surprises Warden Reed by making a visit to Arkham. Reed, in the middle of burning some files, is forced to listen as Jonathan explains that he’s cured himself, despite the hellish treatment he endured at Arkham. Jonathan once feared the Scarecrow, but now the two are one. Jonathan Crane is no more. He’s just the Scarecrow. Heard you the first time, Crane. Back at GCPD, Lucius questions what Bruce was up to that got him injured and Alfred tells Lucius that Bruce fell through a skylight…but before that, he was rock climbing. Well, at least it’s not spelunking. But it’s clear that Lucius isn’t convinced. 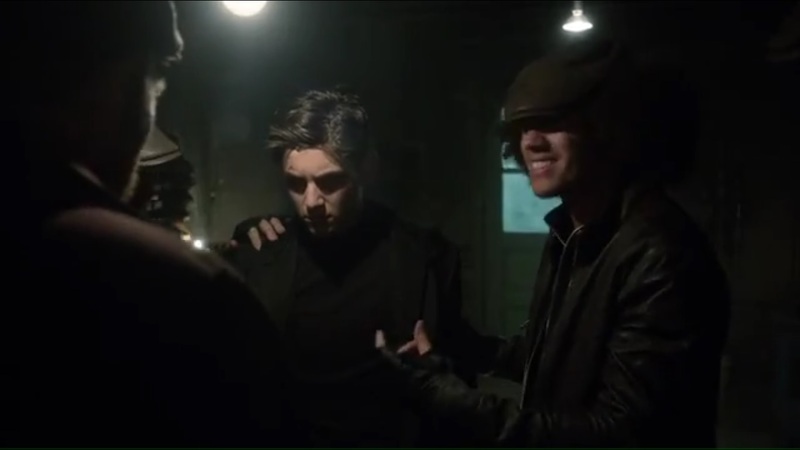 At Arkham, Jonathan tells Reed that Gerald wanted to eliminate fear for Jonathan’s sake. He asks Reed what he fears. Having been sprayed with the toxin, Reed’s fears come to life as he starts seeing demonic clowns. 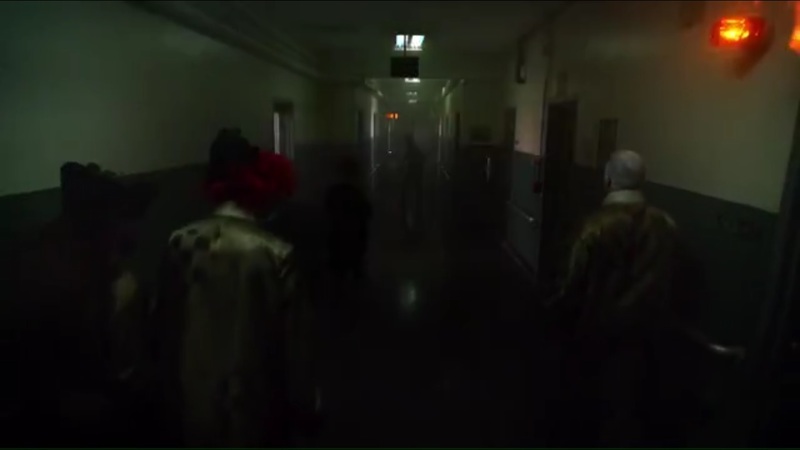 He stalks the hallways and opens fire on any clown he spots, not realizing yet that his victims are not clowns. 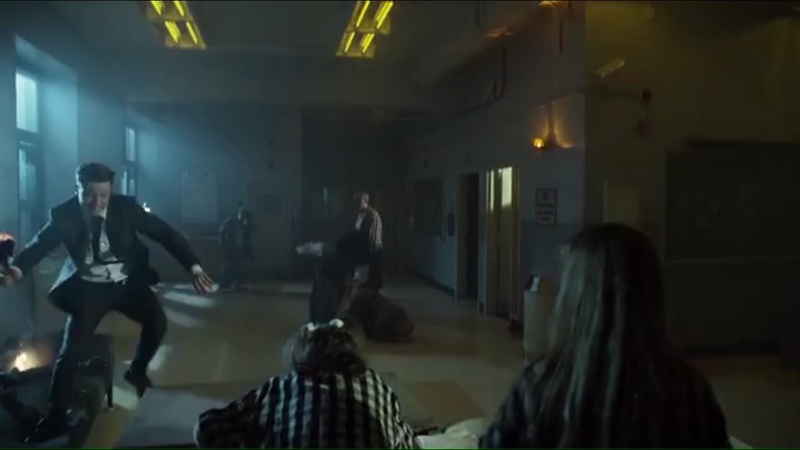 Crane heads to the patients’ ward and tells them that his father was murdered by the GCPD- people who couldn’t understand him. Now, though, these patients will be a part of Crane’s army and the people who killed Gerald Crane will soon know fear. 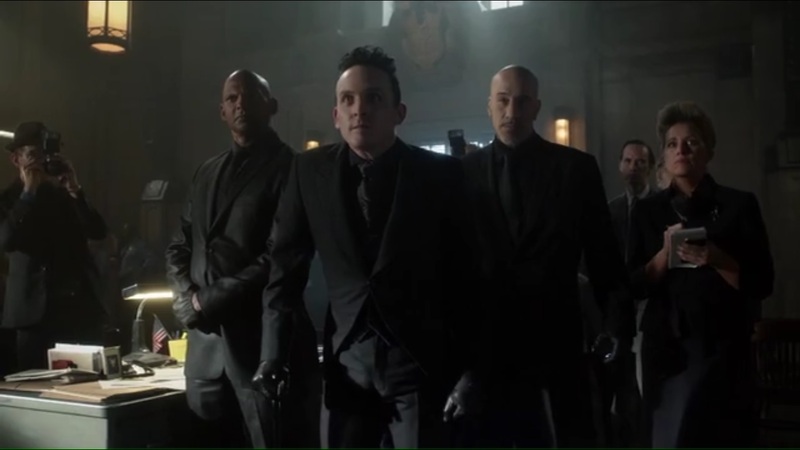 Penguin brings an entourage of the press to the GCPD to rail on Jim for having not captured Jonathan Crane, given that he created the fear toxin. 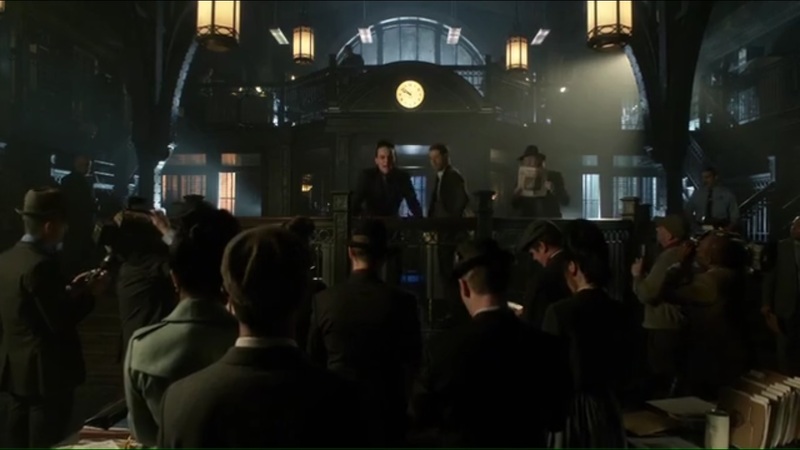 Oswald proclaims that the GCPD doesn’t know how to handle crime and calls the department outdated and corrupt. He’s not entirely wrong. He tells Jim that his licensing program isn’t meant to destroy the GCPD, but to save it. 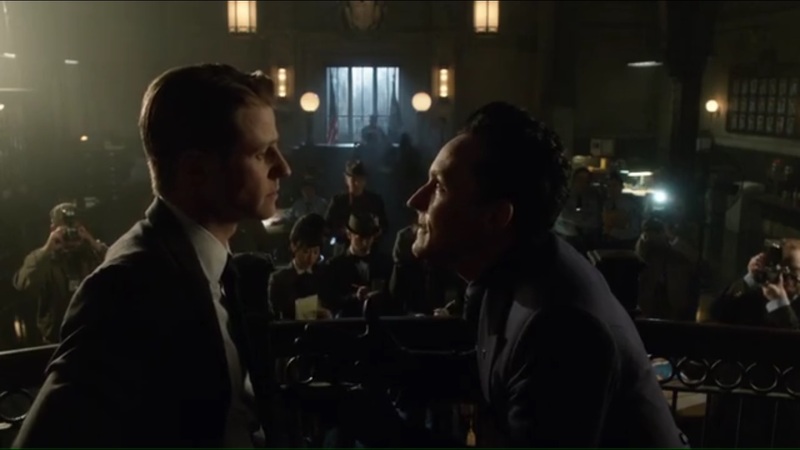 And given how Oswald isn’t putting up with Jim’s Boy Scout morality complex, he makes a deal: find and lock up Crane in 24 hours or admit that he’s failed, thus allowing Penguin to sweep the city clean. The two shake hands and the game is on. Selina meets up with Tabitha and reveals a card left on their doorstep about an awaiting opportunity. 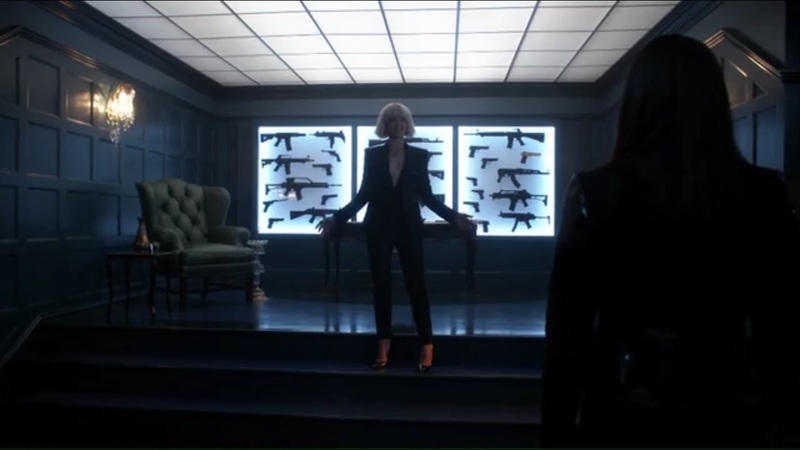 They head upstairs and find Barbara, who must’ve seen Atomic Blonde in-between seasons and became inspired by Charlize Theron’s look. She offers a truce so the three can work together and apologizes to Tabitha for her past behavior, admitting that she was stupid and jealous. And crazy, Barbara. You forgot crazy. But Barbara’s not in another club. Her hideout is littered with guns hidden behind the walls. Since every criminal goes to Penguin in order to commit crimes, Barbara’s rationale is that she can supply them and find out their plans. Tabitha, though, wants nothing to do with Barbara and leaves. Barbara advises Selina to talk with Tabitha. Oh, by the way, Barbara’s explanation for why she’s alive again is that it’s a long story. So we’re probably never gonna get a real answer. I’ll happily be wrong, though. At Wayne Manor, Bruce is heading out for more vigilantism, but Alfred won’t stop Bruce because he’s convinced that, after last night, Bruce isn’t ready. The next muggers could have guns, after all. 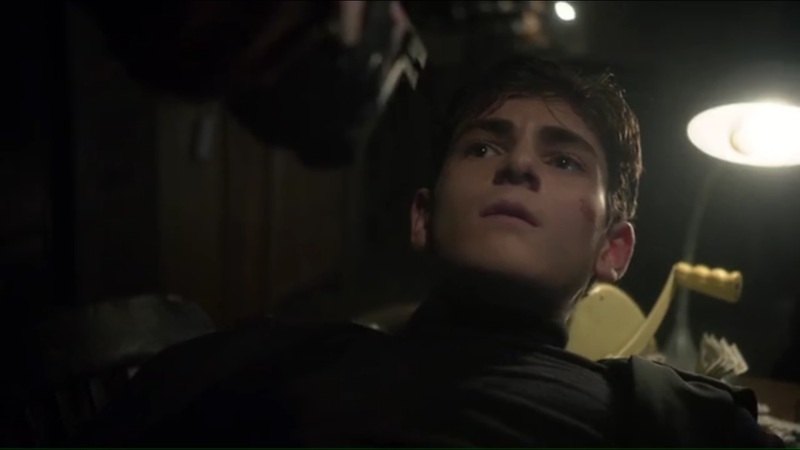 However, Bruce has never felt more alive than he did last night, and that’s just why Alfred won’t stop him from leaving. At the precinct, Jim finds that no officers will join him in stopping the riot over at Arkham. In their mind, the badge has gotten them nothing but disrespect. To Jim’s surprise, even Harvey won’t join him. It’s his day to say ‘Never,’ since if he goes with Jim, he’ll lose the officers and will be replaced by someone hand-picked by Penguin. For now, Jim is on his own. So Jim heads to Arkham alone and finds the asylum in disarray. Warden Reed rushes towards him and soon leaves, leaving Jim in a bit of a scare. Crane, watching this all unfold on monitors, calls out on the P.A. system that the enemy has arrived. Tonight is the night that Jim will know fear. When the inmates attack, Jim fights and fires back, forcing them to retreat. 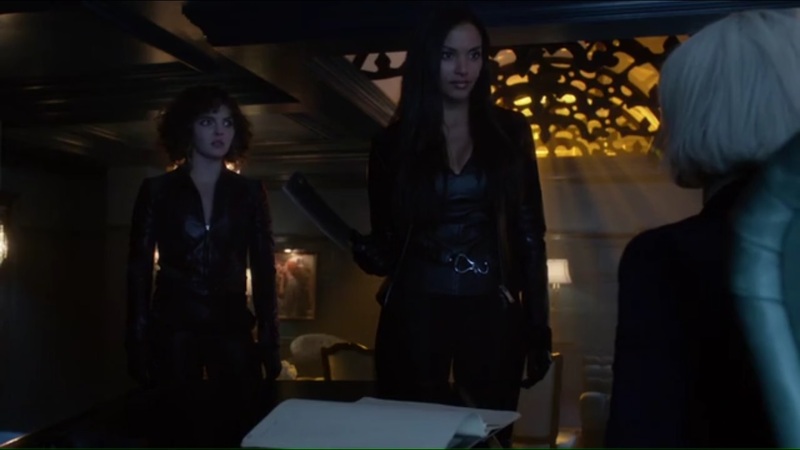 Now Penguin, Ivy, and Zsasz make a surprise visit to Barbara’s hideout and inspect her hardware. Oswald admonishes Barbara for not running this business by him, since he approves all enterprises in the criminal underworld. 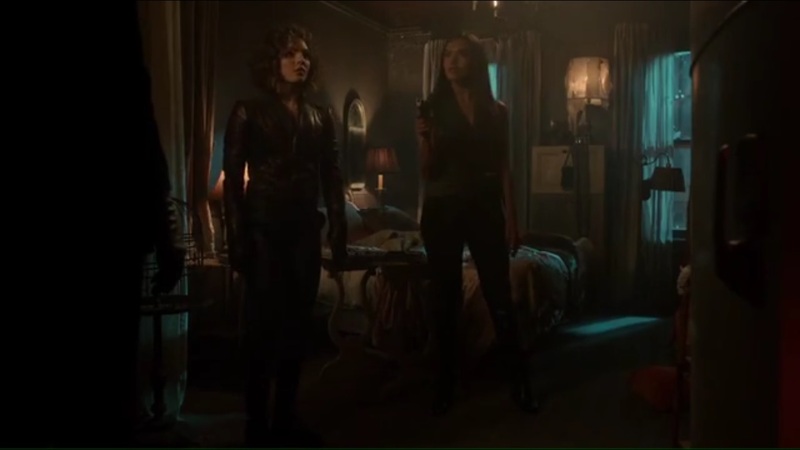 He then warns Barbara against working with Tabitha and Selina since they’re pretty slippery, not to mention Tabitha may be holding a grudge due to her shooting Butch. Penguin tells Barbara that, to run this shop, she’ll need an operating license and have to pay a weapon tax. It’s only fair, I suppose. Oswald vows to keep a close eye on Barbara, should she think about stepping out of line.charge Barbara a weapon tax and tells her that he will be keeping a close eye on her. Plus, he is curious a. how Barbara is back, and b. who is funding her operation. Jim and Jonathan finally come face-to-face, with Jonathan still angry over his father’s death. In his mind, Gerald was trying to help people. And if Jonathan learned anything from his father, it’s that people can embrace their fears instead of being imprisoned by them. With that, Crane gives Jim a face full of fear toxin. And what is Jim’s fear? An infected Jim stalks the asylum until he finds Leslie in a tub filled with blood, as she’s slashed her wrists. She berates Jim, saying that they could’ve had a family, but Jim destroys everything he touches. Crane tells Jim that Leslie shouldn’t die hating Him. He tempts Jim to join Leslie by slicing his own wrists with a blade and finally finding peace. 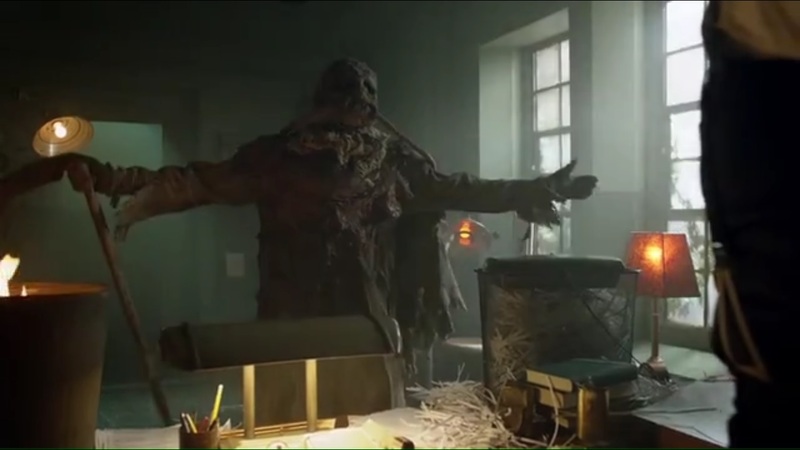 Jim eventually snaps out of it and confronts Crane, telling him that he beat the toxin by overcoming his fear. He offers to help Jonathan, who has now removed his mask and tells Jim that he isn’t weak anymore. Now, he’ll never go back to being that scared, little boy. Bruce stalks and follows some perps to their hideout, but they capture and unmask him. 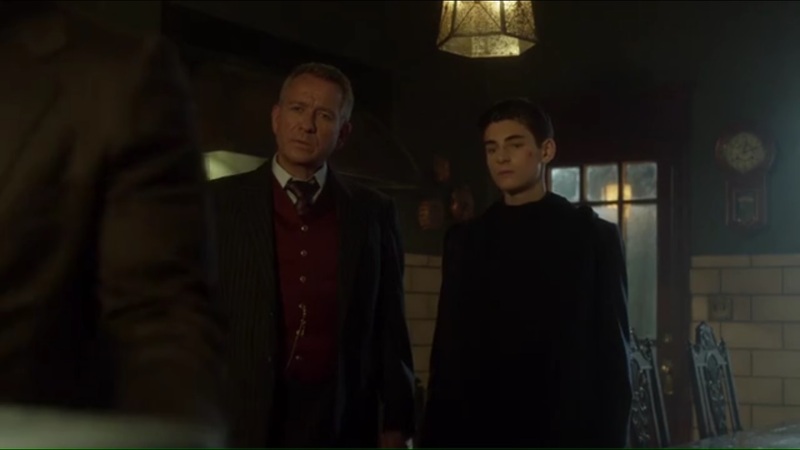 They don’t immediately recognize Gotham’s richest orphan, but instead tell him that what they’re doing is legal under Penguin’s license program. Bruce puts up a good enough fight, despite being outnumbered, and makes use of a nearby grappling hook to escape. 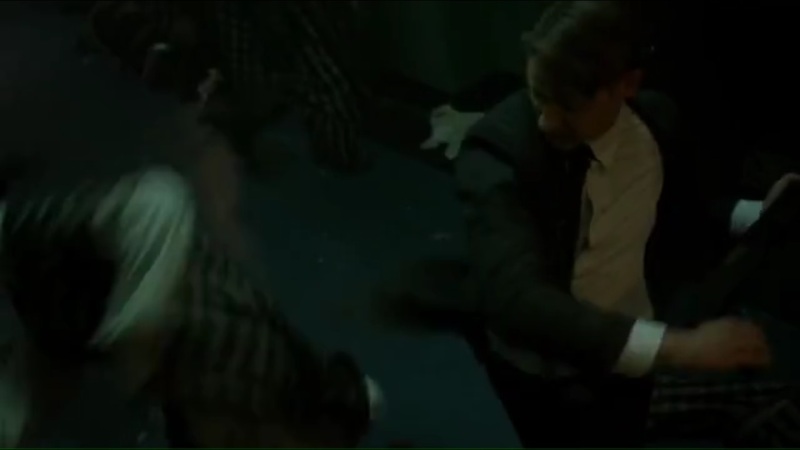 But that’s not good enough and one of the thugs puts their gun in Bruce’s face, but the thug is then knocked out by Alfred. Selina wants Tabitha to give Barbara a chance since she’s tired of not being taken seriously. Know who wants in? Ivy, who is also Batman because she got in undetected. Selina wants to give Ivy a chance, but Tabitha, believing that Ivy is all in with Penguin, tells her to leave. After Ivy exits, Tabitha tells Selina that she’s willing to talk business with Barbara, but she’ll want something in return. Back at Arkham, Crane has gathered the inmates together to take on Jim all at once. However, when Jim sprays the inmates with water and sees that it works, he activates the sprinkler system and is able to gain the upper hand. 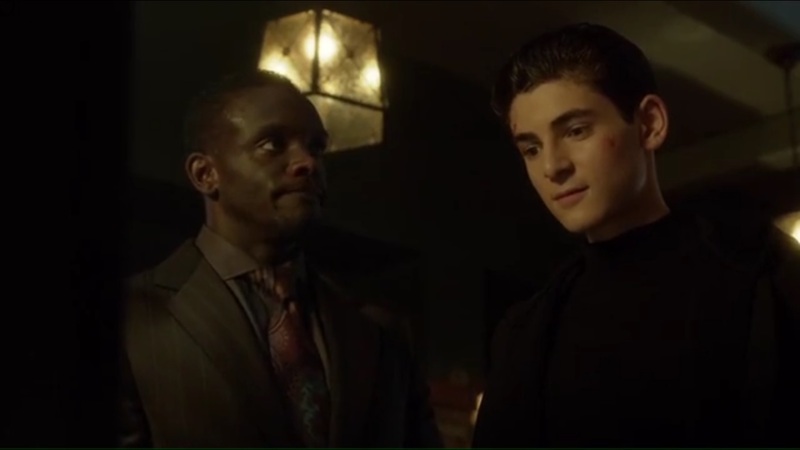 Alfred admonishes Bruce for not accepting that his new line of work could get him killed, but the argument is interrupted by Lucius Fox making a late night visit. He has good news: Wayne Enterprises was creating a durable material for military uniforms. He opens a briefcase and reveals a lightweight, bulletproof uniform, as well as gloves that will help Bruce cling to any surface. Oh, and long distance radio communicators. You know, for rock climbing. And yes, it all comes in black. 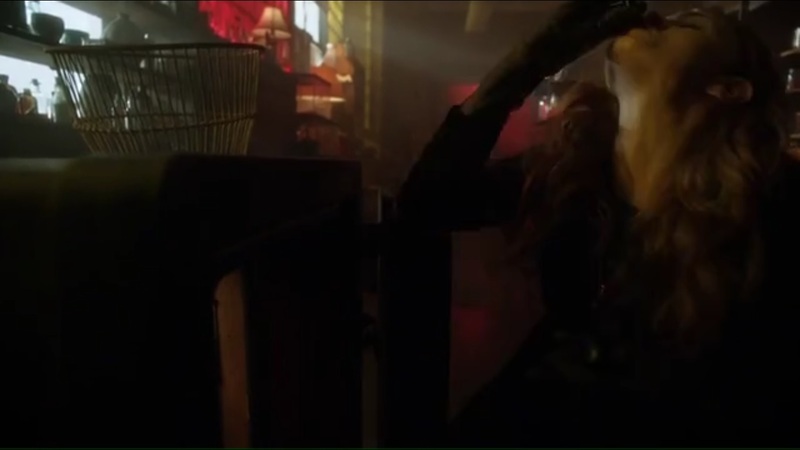 So what Tabitha wants in exchange for working with Barbara is one of her hands, given that both she and Butch lost hands to Penguin and Nygma. Yeah, but Tabitha at least got her hand reattached. Surprisingly, Barbara agrees and holds out her hand, but Tabitha doesn’t cut it off. She’ll trust Barbara. For now. She and Selina will start on Monday. 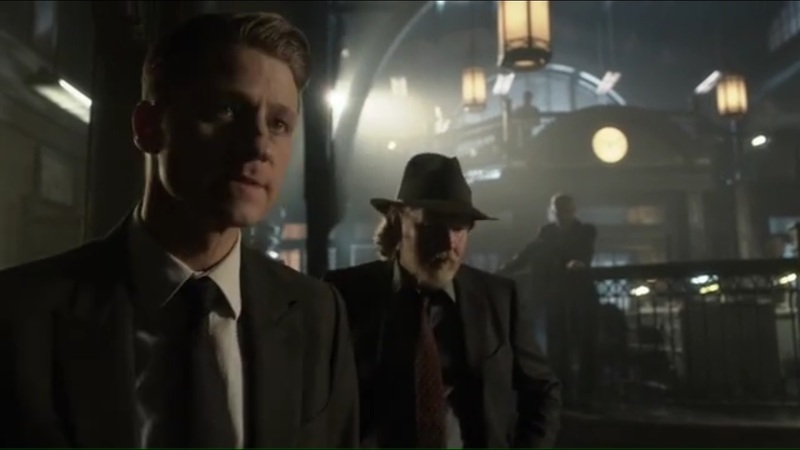 Next day at the GCPD, Penguin confronts Jim, who stands tall and says that there was no deal, given that Oswald just made demands in an attempt to undermine the department. 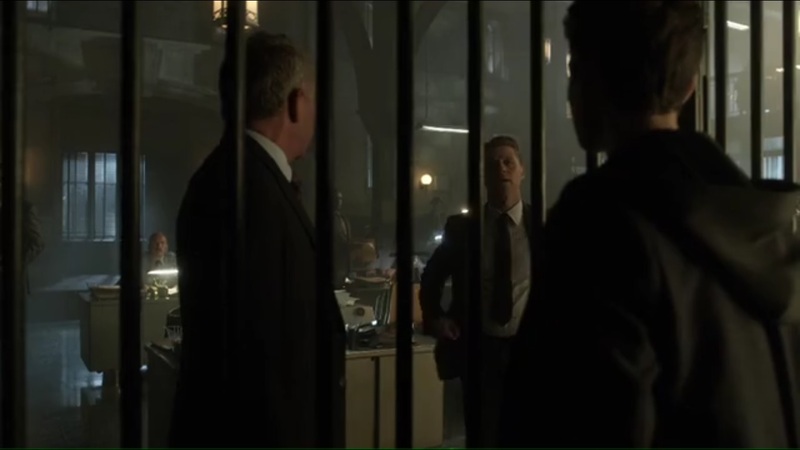 Penguin asks the officers if they’re tired of seeing criminals escape and the GCPD always becoming a war zone. Yeah, I’ll give him that. In Oswald’s mind, It’s time for everyone to police themselves and he offers to triple the wage of any officer who works for him. Harvey explains to Jim that he didn’t join him because this is a war, not one battle. Had he gone with Jim, he would’ve lost the officers, and they need them to win this war. Ivy heads to a shop and tells the merchant that she’s done with perfumes and wants the good stuff- namely the mystical potions made by shamans around the world. This, she believes, will give her power. When she gives the owner a whiff of her perfume, she manages to get access safe and downs every potion she can grab, even though these potions can get into her DNA. 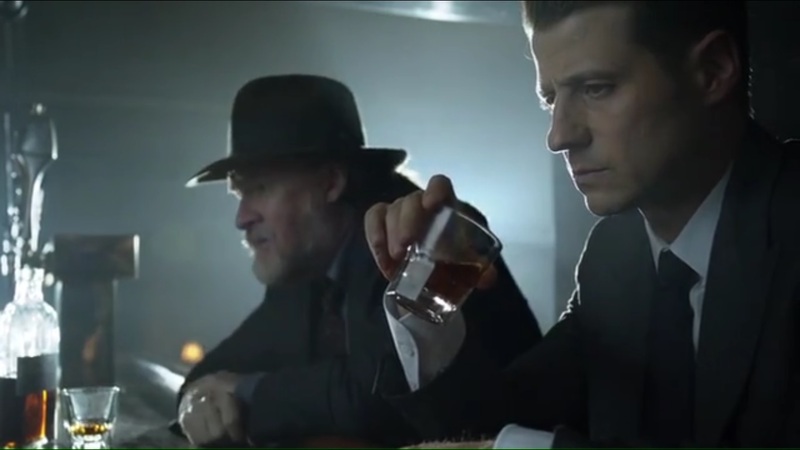 Now that the two are having that drink, Harvey and Jim wonder if they’re winning this war. It makes Harvey miss Falcone. Carmine might have been vicious, but he was at least fair and honorable. This gives Jim an idea. Although he did kill Mario, Jim still thinks going to Falcone may be their best bet since they do need an army to take on Penguin. That night, Bruce trains in his new outfit, complete with all the gear and helmet provided by Lucius Fox. Well, we end with Bruce, so appropriate to start there. This really is trial and error with our future Batman. 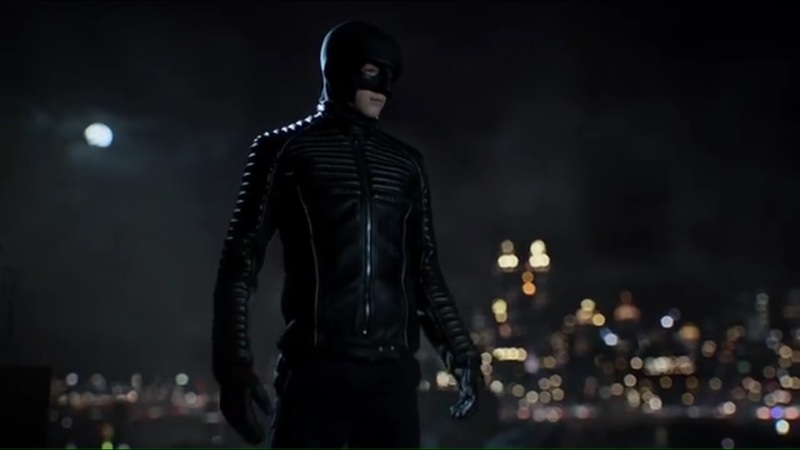 He’s got the gear, now enhanced courtesy of Lucius Fox, he’s still making mistakes learning, and he’s having verbal spats and disagreements with Alfred not on his methods, but for going about this at all, more so because he could wind up worse than just in jail. It’s all aspects of Bruce’s journey to becoming Batman that we’ve seen before. Hell, swap in rock-climbing for spelunking and you’d swear that you were watching Batman Begins. All Bruce needs is some more outfit upgrades- which I’m sure he’ll get as the season progresses- a ride to get him around the city, preferably in black, and to top it off, the very symbol he’ll use to instill fear in Gotham’s criminals. But I’m fine with this approach. Bruce should be making mistakes, getting caught, and finding himself in tough situations, not suddenly become Batman overnight. It’s a slow, believable way that makes this journey feel more earned because he’s had experience seeing Gotham’s criminal element at play, as well as training with Alfred, but now he’s putting those abilities to the test. Of course he won’t win every battle. I’m not surprised to see Barbara back, but I am surprised to see her return so soon. And with Penguin questioning how she’s alive and who is funding her enterprise, I hope we get answers to those questions, as well as why she feels the need to look like Lorraine Broughton. More than that, I’m curious why Barbara would even need Tabitha, and by extension, Selina, to work with her. She knows how to run a criminal business. Surely it wouldn’t take much for her to get some hired goons unless she’s trying to stay completely out of Penguin’s radar. Of course, that didn’t work since he finds her anyway. Unless she is being honest with trying to make amends with Tabitha, I don’t see why she doesn’t just go about this with her own devices. Otherwise, if the two join forces, I’m just waiting for Barbara to turn against her again. It’s sad when Penguin is the one calling out how inept the GCPD is at their job. 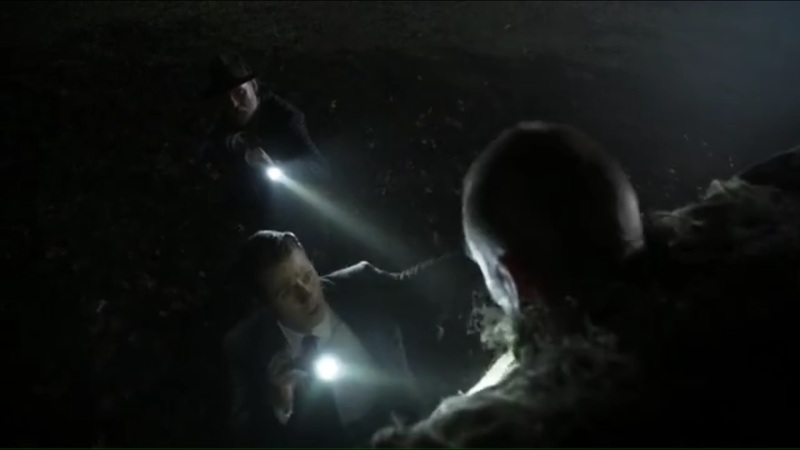 We’ve known this for four seasons now and as much as Jim may not want to admit it, Oswald has a point. Plus, how many seasons can we have the GCPD turned into a war zone? Never mind that anyone, good or bad, can just waltz into the precinct no problem. 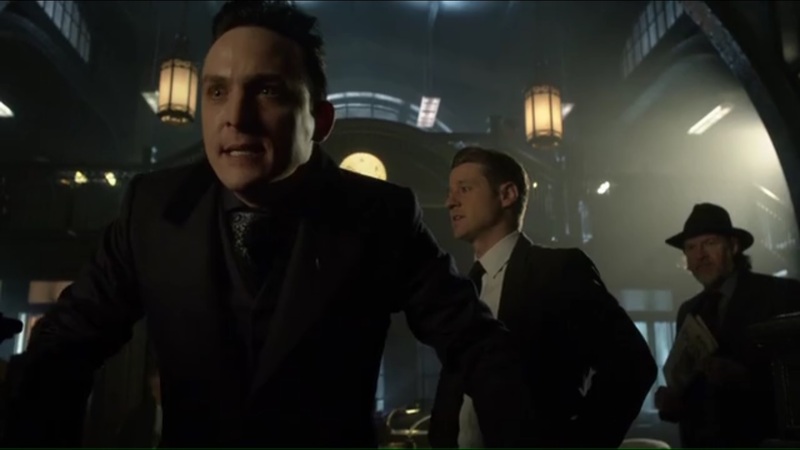 While it seems like there’s a point when Penguin’s plan could go downward, for now, he’s got the public on his side and he’s sympathetic to the officers who are tired of feeling useless. Maybe they’d feel less useless if they cleaned up their act and stopped living up to the stereotype. 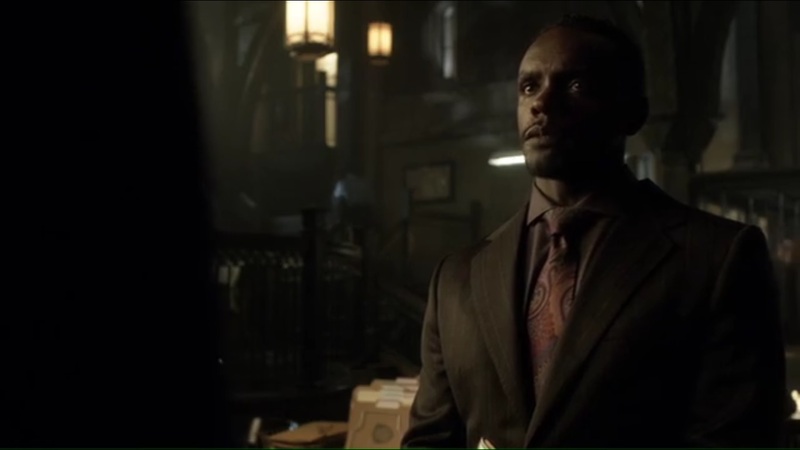 At least when Barnes became captain, he made an effort to weed out corrupt officers within the GCPD’s ranks. All Jim can do is be the moral voice of reason, and he’s served that role for four seasons now, while committing his fair share of crimes that make him just as unworthy of the badge. He’s playing the short term game while Harvey is looking at the bigger picture and just trying to keep the officers loyal, even if they are ineffectual. So going to Falcone must be a last ditch effort, given Carmine’s fractured relationship with Jim. I could’ve done with more of Jim facing off against Crane in Arkham. It ended faster than it needed to and it doesn’t help that the fear toxin is coming so soon after Mad Hatter’s Tetch virus. Nor did we need to see Jim having more confrontations with Leslie, dream sequence or not. 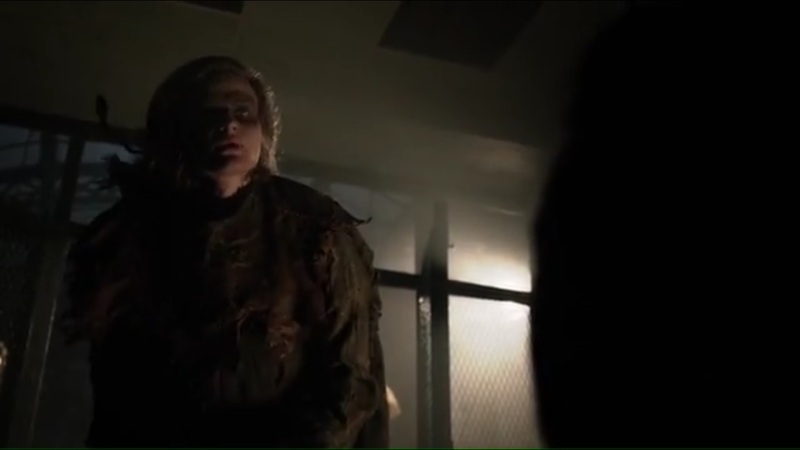 Gotham could’ve stretched this into two episodes to ratchet up the fear. But Jim’s one man army prevailed once again. “The Fear Reaper” was a pretty decent episode. It put Jim further at odds with his fellow officers while Penguin is still pushing to change the city from top to bottom. All the while Barbara’s return has already put her at odds with Penguin, and possibly Tabitha as well, despite their arrangement. And who knows what will become of Ivy after taking all those potions? As for Bruce? 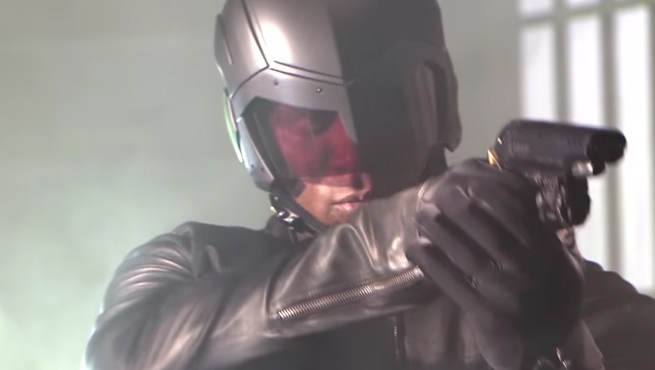 Go to Star City and give Diggle back his helmet. This entry was posted in Gotham and tagged Anthony Carrigan, Barbara Kean, Batman, Ben McKenzie, Bruce Wayne, Bruno Heller, Camren Bicondova, Charlie Tahan, Chris Chalk, Damian Young, David Mazouz, DC Comics, Donal Logue, Erin Richards, FOX, Gotham, Grady Harris, Harvey Bullock, Ivy Pepper, Jim Gordon, Jonathan Crane, Leslie Thompkins, Louis Shaw Milito, Lucius Fox, Maggie Geha, Michael Maize, Morena Baccarin, Oswald Cobblepot, Penguin, Robin Lord Taylor, Selina Kyle, Victor Zsasz, Warden Reed by omarid513. Bookmark the permalink.